This is a not-for-profit event and all money raised goes directly to The Birth & Babies Appeal. As you know, for over a year now we have been supporting The Birth & Babies Appeal at Warwick Hospital. The appeal is raising funds for the newly opened Bluebell Birth Centre in the grounds of Warwick Hospital. You can read more here. The appeal is just a few thousand pounds off their total of £200,000 which has been used to equip the birth centre with some of the most incredible, state-of-the-art equipment, that will make a difference to each and every family who uses the birth centre. Please join us in our penultimate fundraiser for this charity. 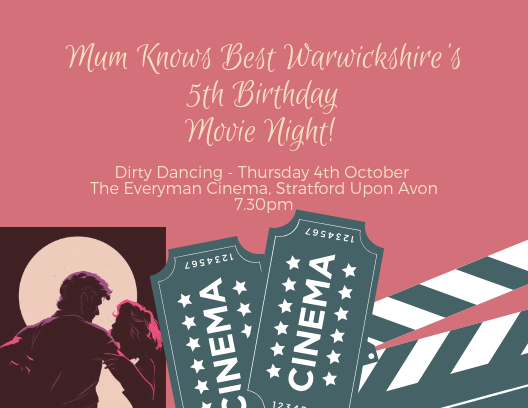 We are holding a movie night at The Everyman Cinema in Stratford Upon Avon. The Everyman Cinema boasts a unique cinema experience offering each and every cinema-goer comfortable, sofa and arm-chair style seating with ample leg room. What’s even more special is that you can order food and drinks to your seats, making for a real treat experience. I can count on one hand the amount of times i’ve been to the cinema lately, and all-bar-one of those times I was watching children’s films during the holiday! This is your chance to take one night out of your diary, meet for a quick drink and watch a true classic… all this with DISCOUNTED tickets and amazing food and drink, whilst supporting a charity that will really benefit from our night out. So, if you’ve been heard to say “I can’t remember the last time I had a night off” or “I just need a little me time” or you just fancy meeting some other people and chilling out, BUY YOUR TICKETS NOW. See you there… and remember “Nobody puts baby in the corner”! Posted on September 22, 2018 by Nikki. This entry was posted in Whats on in Warwickshire and tagged charity events, movie night.